Successfully Added 4 K digital camera -1/4 inch CMOS, 16x digital zoom,, 4 K video, 24 MP images, 3 inch display, application, 128 GB SD card suppo to your Shopping Cart. Record all your upcoming adventures at this amazing 4K resolution with this professional digital camera. Its compact design makes it easy to carry this camera with you in your bag. It allows you to take amazing videos of 4K resolution and 24MP photos. 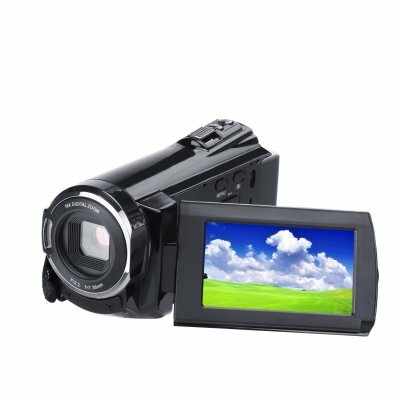 If you want to take your video to the next level, this digital video camera is perfect for you. Because of its 13MP CMOS sensor, you will be regarded as a very vivid color with very detailed lens. Whether you use it to record sports games, family movies, or holiday videos, this 4K digital camera ensures that you meet your requirements. Because of its anti shake function, you can rest assured that you will always get the smoothest and highest quality recording. The camera has the ability to recognize and control facial recognition and photography easily. With its powerful 2500Mah battery, this beauty provides an hour worth of recording time. It also supports a 128GB SD card, and you can store all your recordings and pictures. When using this 4K camera, you don't have to worry about running out of storage space in the near future. With built-in microphone, it records high quality audio and video - so when you play back the recording, you will see an excellent audio-visual experience. On the camera's 3 inch LCD display, you can enjoy live watching while recording. It also provides you with the possibility of instantly replaying previously recorded scenes. The camera is equipped with 16 times digital zoom, which allows you to record events from near to far. Because of its intelligent design, you will be able to synchronize your 4K camera with iOS and Android phones to take the absolute maximum of all functions. With this affordable 4K camera around you, you can take pictures and videos, if you are a real professional. This 4K camera comes with a 12 months warranty, brought to you by the leader in electronic devices as well as wholesale digital cameras.. Battery Usage Time:Duration: turn on infrared and WiFi, 1 hours, only infrared or WiFi, 1.5 hours, normal mode (without infrared and WiFi) for 4 hours.